Here are some more pictures I took on Thursday, August 21st after doing some more exploration of the rust. 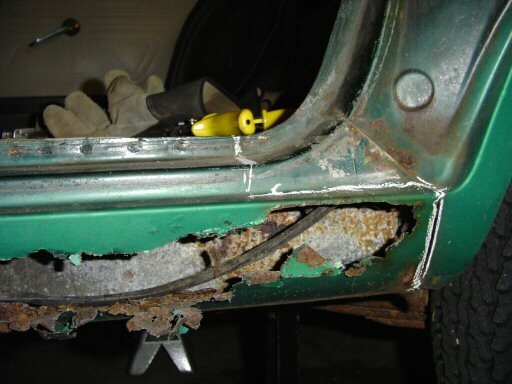 This day's goal was to get the car on jack stands and determine good cut lines for welding in the patches. The first picture shows the outline of what is going to be replaced on the rocker cover. I'm basically avoiding any areas around the door opening where the factory cover is curved upwards. The rear line is also dictated by a few cuts on the replacement part that I think avoid the same areas on two door models (the cover I'm using is made specifically for two door models). Also, the lines are drawn with chalk which will stay put while I'm cutting but will be easy to change if I need to. Here's the front part of where I'll be cutting. The chalk line is roughly an inch and a half in front of the last soft spot in the factory cover. You can also see where the outer rocker (this is the part that has the two stamped holes in it) ends. It's supposed to go the entire length of the rocker. 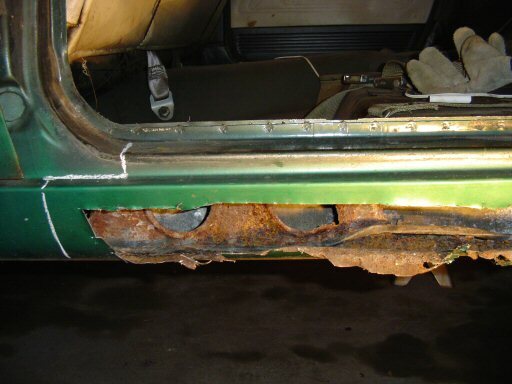 I'll be fabricating a replacement for this. 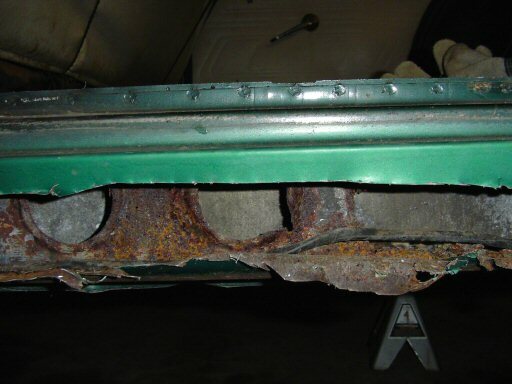 Any metal that gray is due to the fact that the inner and out rocker panels are galvanized from the factory to prevent rust. If it wasn't for the mouse nest, the outer rocker would most likely still be there. Here's the rear part of what I'll be replacing. Notice that there is no outer rocker in this area. Also, the metal was rusted enough that I was able to create this opening using nothing more than an awl and my fingers. Here's a close up of the outer rocker panel (this is the part I'm fabricating). The holes are used to strengthen the panel. If you look at them, there is a raised area around each opening. This is where the panel gets a good deal of its strength. Here's the new replacement cover. It's really for 68-74 AMX's and Javelins, 64-69 two door and convertible Americans, and 63-64 two door Ambassador's and Classic's. 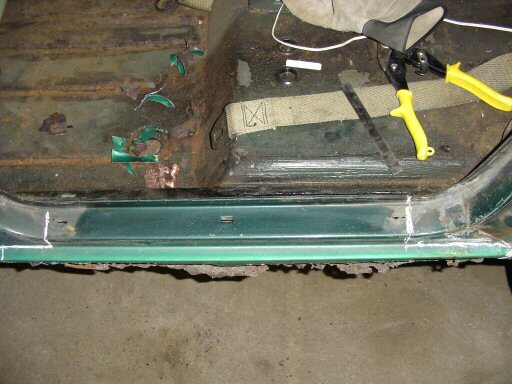 These can be used to replace rocker covers on four doors and station wagons of the same years and models but you'll need to buy three of them to do both sides completely and you'll have to do extra trimming around the "B" pillar. Here's a view of the top of the panel. You can see where it's notched to avoid having to deal with the curved areas around the door openings. This final picture shows what color the car was originally. I'm really looking forward to getting the car back to this color all over! For now, I'm going to settle for the green that I used around the windshield.